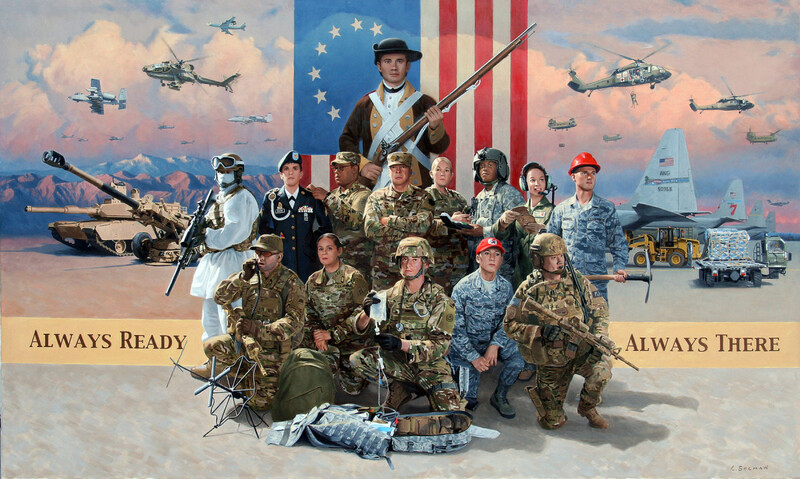 Image Dimensions: 25" x 15"
The National Guard is our country's oldest military force, tracing its roots back to the first regiments of the Massachusetts Bay Colony. From those initial roots to the ever-evolving world we live in today, the Noncommissioned Officers and Enlisted Soldiers and Airmen of the National Guard have proven they are more resilient, relevant and ready than ever before. In recent years, the National Guard has been called up in unprecedented numbers to serve at home and abroad. Our Enlisted Citizen-Soldiers and Airmen answer the call to both state and federal missions and serve wherever and whenever they are needed, often spending time apart from their families to protect and serve this Nation. As a professionally trained and diverse force, they come from all walks of life, cultures, and backgrounds, and bring a myriad of skills and abilities with them. They serve in a variety of military specialties in Army and Air National Guard units across all 54 States, Territories and the District of Columbia and are an indispensable part of the total operational force. The National Guard succeeds through the commitment and extraordinary talent of our men and women in uniform. "Always Ready, Always There" is the motto of America's National Guard. It embodies the character and spirit of all enlisted personnel who have served in the National Guard since its founding in 1636. The Enlisted Association of the National Guard of the United States is proud to honor and recognize the exceptional contributions of our enlisted force. A South Central Pennsylvania native, Larry Selman was raised in a military family. His love of history and art has been nurtured all of his life. These interests led him to enroll at the York Academy of Art and earn a commercial art degree in 1982. Following graduation, Selman built a successful career with paperback novel illustration. He collaborated with top art directors and major publishers form all over the country. After a long and successful career as a commercial illustrator he moved into the Western fine art and recently the historical print market.